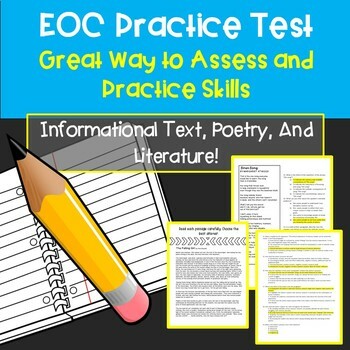 This is a quick assessment to prepare and practice for the English II EOC. It could also be used to practice or assess Reading and Writing skills in any 9-12 English classroom. I have used this piece as a benchmark for my students, as well as pre-assessment when they first enter my classroom at the beginning of the year. I've found that this is a great way to more fully understand a student's strengths and growth areas as it tests students on Poetry, Informational Text, and Literature.